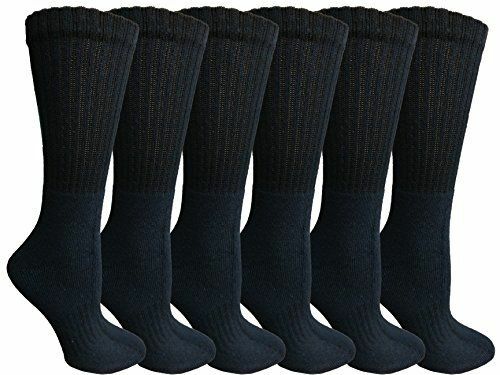 Womens Anti-Microbial Crew Socks, Comfort Knit Ringspun Cotton, Terry Lined, Premium Soft (6 Pack Navy) at low wholesale prices. Socksinbulk.com offers Womens Crew Sock at bulk discounted prices. CONSTRUCTED FOR COMFORT: This sock is constructed solely for your comfort. The ringspun cotton blend offers a superior softness when compared to typical crew socks. Designed to be a premium sock for multipurpose use. Made with premium fibers including 80% ring spun cotton, 15% polyester, and 5% spandex. REINFORCED FOR COMFORT & DURABILITY: Features a reinforced heel for added comfort and durability. A non binding top makes the sock less constricting allowing you to wear it for lengthy wear. That also means no marks on your legs from socks that are too tight. These socks also offer arch support for your feet. 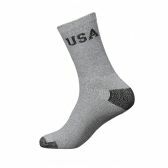 TERRY LINED CREW SOCKS: These terry lined socks makes these socks ideal for wearing under harsher weather conditioners. Ideal for the winter time by keeping your feet warm and cozy. Ideal for a wide range of sports, activities, and those who enjoy spending time outdoors. Introducing a premium pair of crew socks for ladies. Designed for your comfort and made to last. Features a terry lined interior, reinforced heel, and high quality ringspun cotton. These women's socks are constructed for the great outdoors and can be worn across a variety of activities including sports, exercising, and more. Wicks away moisture to keep your feet cool and dry. These anti-microbial socks also fends off bacteria and prevents odors. A non restricting top allows for long periods of wear while staying comfortable.